New Delhi: Prime Minister Narendra Modi, who visited the hill shrine of Kedarnath in Uttarakhand on Friday morning, prayed for "India's progress" and well-being of the people of the country. The revelation was made by the Prime Minister on Twitter when asked by a user about what he prayed for at the shrine. PM Modi visited the shrine before it closes for the harsh winter in the higher reaches of the hill state. This is his second visit to the temple this year; he went to Kedarnath last on May 3. 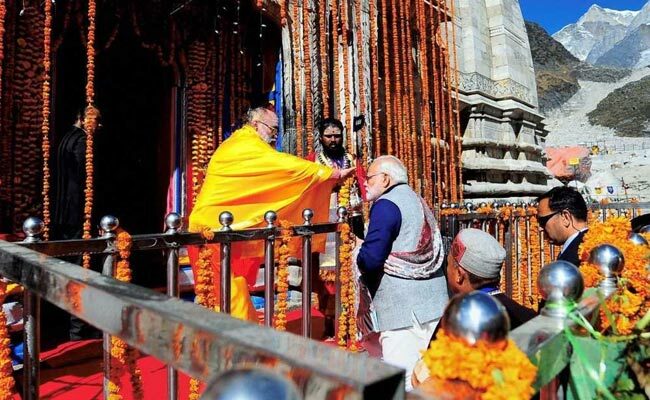 "From this holy land of Kedarnath, I seek the blessings of Bhole Baba and pledge to devote myself fully to realising the dream of a developed India by the time we mark 75 years of freedom in 2022," PM Modi told a gathering of officials, priests and locals at the mountain shrine. He described the projects for which he lay foundation stones today as ambitious and expensive, but said there would be no dearth of funds to ensure that they are completed on schedule. These include improved facilities for devotees, construction of retaining walls and ghats at the Mandakini and Saraswati rivers, an approach road to the shrine and reconstructing Adi Guru Shankaracharya's tomb which was destroyed in 2013. Prime Minister Modi also took a swipe at the Congress saying that the party which was in power in the state, had not allowed him as Gujarat Chief Minister to rebuild the hill shrine after flash floods devastated it in 2013.